The rise and fall of the Saraki dynasty. The younger sister of Bukola Saraki, Nigeria's Senate President, Gbemisola Saraki, has said her brother failed to live up to expectations while he served as Kwara State governor. Ms Saraki called out his brother on a national TV programme. She criticized her brother's performance and asked for forgiveness from Kwarans while appearing at TVC's"Your View" on Thursday. 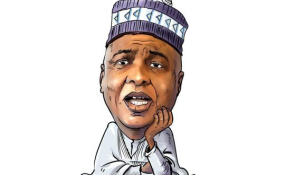 Mr Saraki lost his bid to return to the Senate and may not be active politically for the next four years if the PDP presidential candidate, Atiku Abubakar, whom he supported does not succeed in his bid to challenge President Muhammadu Buhari's electoral victory. Mr Abubakar lost to Mr Buhari at the last presidential polls but is challenging the victory in court. The Saraki dynasty in Kwara since 1979 has produced six governors from the time of late Olusola Saraki who is the father of the Senate President. The Saraki structure was strong force that except you aligned with it politically, you were not likely to succeed as a politician in Kwara State. The Senate President was elected governor of Kwara in 2003 through the help of his father. After his tenure, he refused to support the candidature of his sister, Gbemisola. Instead, he supported the incumbent governor, Ahmed Abdulfatai, who floored his sister against the will of his father. In the build-up to the 2015 election, Mr Saraki joined other aggrieved governors of the PDP to form the nPDP. The nPDP would later join other parties to form the All Progressives Congress (APC). That did not affect his control of the Kwara's political machinery as Mr Saraki's new party, APC, won the 2015 general elections in Kwara. He began to face challenges after the 2015 elections when he defied the APC, to emerge the Senate President, working in cahoots with PDP lawmakers. He, eventually, left the APC for the PDP in 2018 and sought the presidential ticket of the latter. He lost at the primary to Mr Abubakar. Mr Saraki was floored in the last elections. While the Senate President failed to deliver to PDP in the the presidential, national assembly and governorship election, he also lost his re-election to the Senate. With the magic of the political slogan, "Oto ge" (enough is enough), the PDP lost in all the 2019 elections in Kwara. Reacting to the development, Gbemisola Saraki, herself a former senator, said she was disappointed with the way her brother governed the state. "I am disappointed that Bukola Saraki did not do well when he was a governor in Kwara State having studied in the United Kingdom. Bukola and I studied in the United Kingdom, he knows all the good things in the United Kingdom. We think (thought) he should (would) reciprocate that in Kwara when he became the Governor but he failed them. "Even as a Senate President, he has not carried the people of Kwara along. I am not happy the way my brother served Kwarans." She appealed to the newly elected state governor, Abdurahman Abdurazaq, to give her the "opportunity to correct the family wrong to avoid nemesis". "I just want the governor elect to give me a chance to serve the people of Kwara. Just to say we are sorry. I don't need appointment. Nemesis will catch up. I don't want nemesis to catch up on my children, my grandchildren or upon myself. That's why I am saying the truth now."